Let me introduce myself by telling you that I am a female who doesn’t normally drink sugar-free or diet soda. Thus, I am a good reviewer of Zevia Caffeine Free Cola for those who don’t like “diet” drinks, but I am a poor reviewer for those who prefer such drinks. Keep that in mind. Zevia Caffeine Free Cola is advertised as an “All Natural Soda,” which may appeal to those who don’t care to drink chemical concoctions. In addition to being caffeine-free, it also purports to be gluten-free, calorie-free, and sugar free. I could not imagine gluten being in sodas, but after a little research, I discovered that a few dark sodas use a gluten by-product to make the soda carmel-colored. 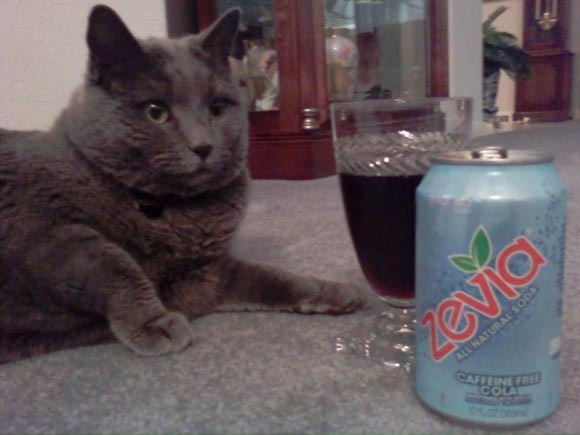 Luckily, Zevia Caffeine Free Cola is NOT one of those drinks. Zevia is sweetened with Stevia, and a serving contains 20 mg of sodium. The can design is very plain: I suspect that the manufacturer’s aim is to convey an idea of sparseness for the serious dieter or avoider of sugar and/or caffeine. Upon the first sip, I thought, “Diet cola. It tastes like a diet cola.” However, I didn’t hate it, and after several sips, I established that Zevia Caffeine Free Cola has a softer, gentler version of that bitter, “off-spec” taste shared by all sugar-free drinks. It whispered to my taste buds rather than screamed. I could almost pretend that my beverage really included that nectar of the gods: sugar. The “fizz” level is average or slightly less. There is a bit of a Stevia aftertaste from each swig. If I drank diet sodas, I would try it. If I were desperate for a cola and could not have caffeine, I’d buy it. According to the manufacturer, “It’s what soda should always have been.” You decide. Twist comes in all shapes and sizes... actually that's just a cat. 4. Buy a Bottle, All Natural, Cola, Fan Review!